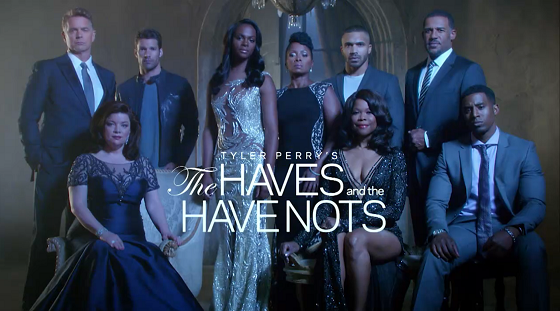 New episodes of The Haves and the Have Nots premiere on June 21. Tyler Perry drama The Haves and the Have Nots, starring John Schneider and One Life to Live alum Tika Sumpter, returns for its new summer season on Tuesday, June 21 at 9 p.m. ET/PT on OWN: Oprah Winfrey Network, followed by the series premiere of Greenleaf at 10 p.m. ET/PT. In the new season of the hit soapy drama, the hunt is in full swing as Candace Young (Tika Sumpter), Jim Cryer (John Schneider), David Harrington (Peter Parros), Veronica Harrington (Angela Robinson), Katheryn Cryer (Renee Lawless) and Jeffery Harrington (Gavin Houston), are all on the run for the heinous crimes they have committed. Hanna (Crystal Fox), the moral conscience, is also tested like never before when her daughter Candace's (Tika Sumpter) latest hustle fails miserably. Knocked down, but not dejected, Candace is more desperate than ever and sets her eye on a new man she hopes to entice with her irresistible feminine wiles. Meanwhile, Katheryn Cryer shows her family and friends just how far she'll go when someone crosses her and Jim and Veronica are rendered helpless as she unleashes her fury. Fans of The Haves and the Have Nots will also get the chance to relive and catch up on all of the scandalous moments with their favorite characters during "The Haves and the Have Nots Binge-A-Thon" beginning with the very first episode Saturday, June 18 at 10 p.m. ET/PT, through Tuesday, June 21 at 9 p.m. ET/PT, leading into the new season premiere. OWN's highest-rated series, "The Haves and the Have Nots last season was primetime's #1 original cable series among African-American women and total viewers.